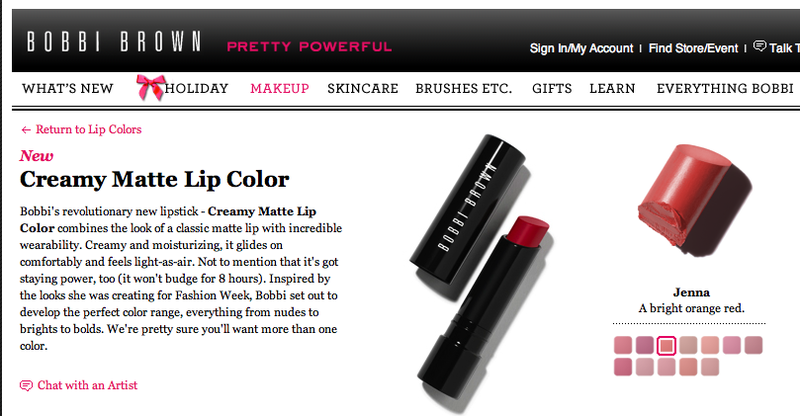 Bobbi Brown’s newest Creamy Matte Lipcolor. My fave is this one called Jenna. Huge for fall, and still an obsession, finding the perfect “red” shade of lipstick. I’ve got a bit yellowish skin, and a bit darker say than the pale-bunch, so I love the coral families of color. It’s not completely unusual to find moisturizing matte lipcolor, but this one by Bobbi Brown does the trick. It’s got the perfect amount of staying power, with a fairly good “smoothability” rating. Seduced by the counters at Neiman Marcus (of course) I had to try the loudest red-orange shade of the bunch: Jenna. It was total love at fist application. Soft but lasted through at least three iced tea refills at the afore mentioned cafe. How much? $24. SOLD! This entry was posted in beauty, makeup and tagged beauty, color, fall, lipstick, makeup, red on October 16, 2012 by pualana.